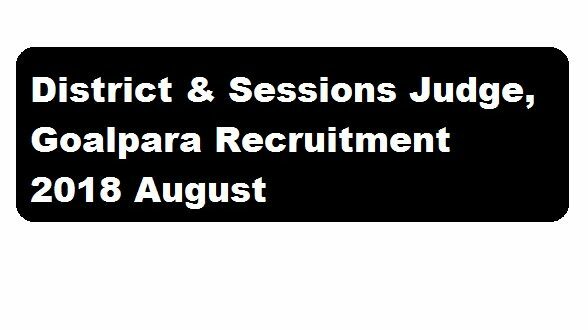 District & Sessions Judge, Goalpara Recruitment 2018 | Peon [2 Posts] :- District & Session Judge Goalpara has recently published a recruitment 2018 notification in the month of August 2018. Applications are invited from intending candidates who is a citizen of India as defined in articles 5-8 of the Constitution of India in the prescribed Standard form of application published in Assam Gazette Part-DC for filling up the following vacant posts of Peonin the establishment of the District & Sessions Judge, Goalpara, with usual Scale of Pay and allowances as admissible under the Rules. We have discussed in details about this recruitment below. In this section, we will discuss in detail about Recruitment of District & Sessions Judge, Goalpara Recruitment 2018 August with all the details and requirement. Pay/salary : Rs. 12.000/- to 37,500/- + G.P. Rs 3,900/- P.M.
Category : 1 (one) post is reserved for ST (H) and 1 (one) post is as per reservation Policy. Age Limit : A Candidate should not be less than 18 years and more than 43 years of Age as on 01.01.2018, the relaxation of upper age limit for reserved category will be as per Rule in force. Educational Qualification : The Minimum educational qualification of the candidates for the Posts is required Class-VIII (8) Passed. (a) Photo Copies of all Certificates in Support of qualification. age, caste and other testimonials. (b) 2 (two) copies of recent Passport Size Photographs. (c) A Self addressed envelope (size 22 cm x 1 Octn) affixing Postal stamp of Rs. 5.00 (Rupees five) only. a) The appointment against the sanctioned Post will be made in accordance with the provision of the AFRMB Act. 2005.
b) NO TA/DA will be paid.